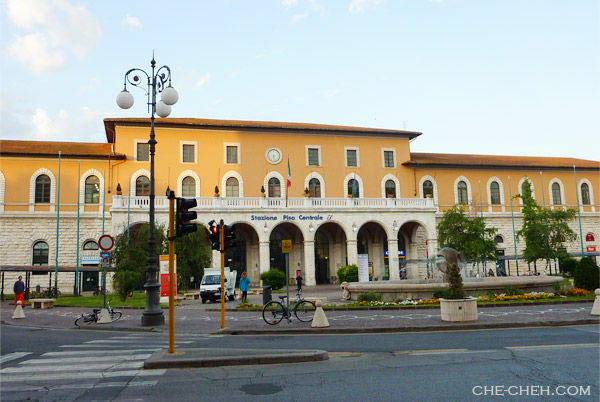 We woke up at 4.45am and by 6am we checked out of Pensione Rinascente and walk to Stazione Pisa Centrale (Pisa railway station). We didn’t have the chance to say goodbye to our host. They’re still asleep. Kekeke Breakfast is croissant bought the night before. 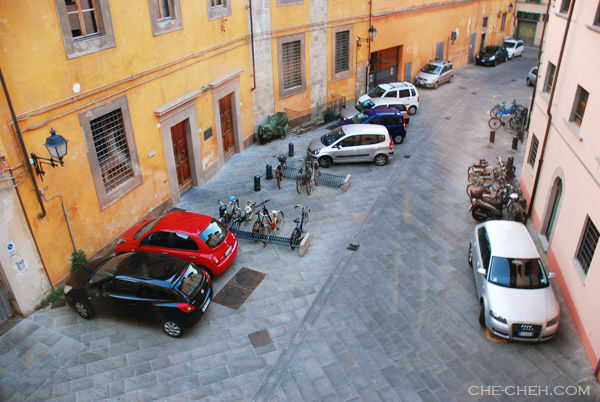 5.50am view from our room @ Pensione Rinascente, Pisa, Italy. 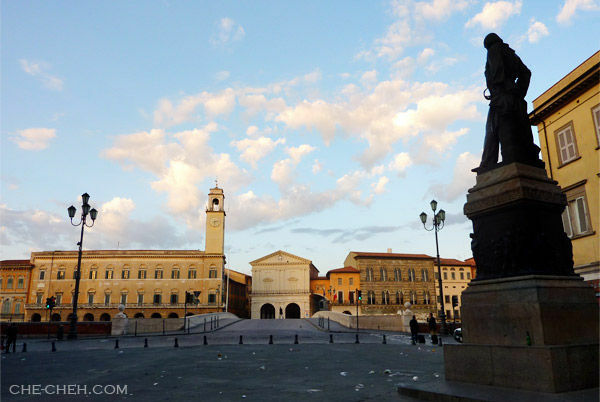 Piazza Garibaldi @ Pisa, Italy… on our way to the railway station. 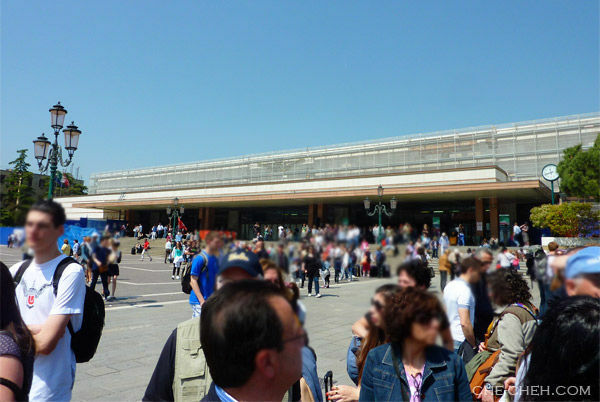 Pisa Central Railway Station. The walk took 20-30 minutes. The street were basically deserted at 6.30am. We had wanted to take the bus but because it was a Saturday, the bus operation time is later than usual. We need to validate our train ticket here. 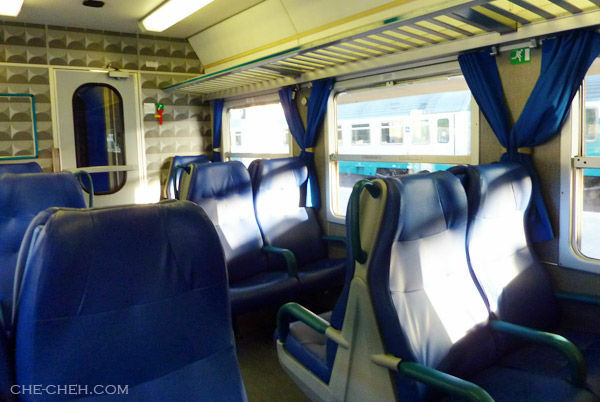 On board Italian regional train (local train) from Pisa To Florence, Italy. The train ride took about 1 hour 15 minutes. Train ticket cost €7.10 per person. Since it’s a regional train, you can hop on anytime within the 6 months expiration period. 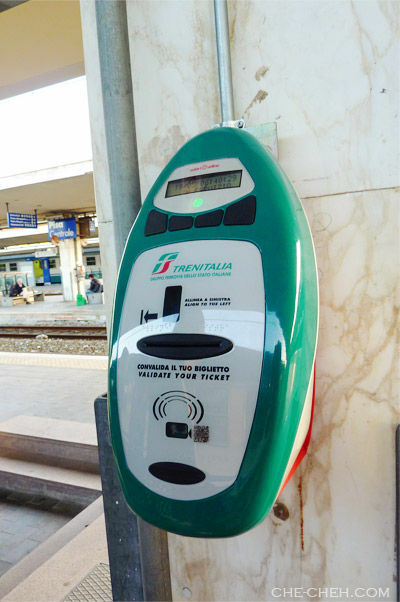 This is the train ride which we went huffing and puffing about, regarding its ticket at Roma Termini. We hopped on the 6.54am train. 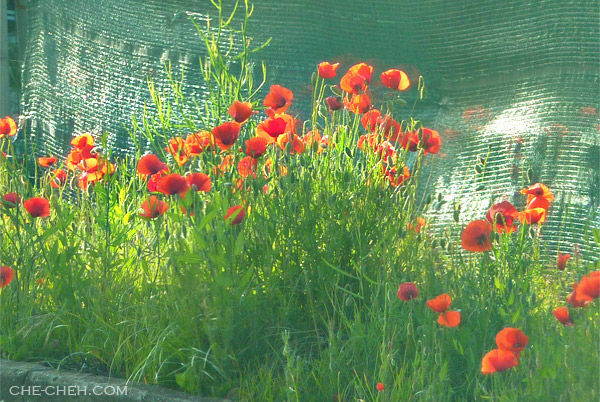 Saw lots of flowers along the train tracks. Lovely! 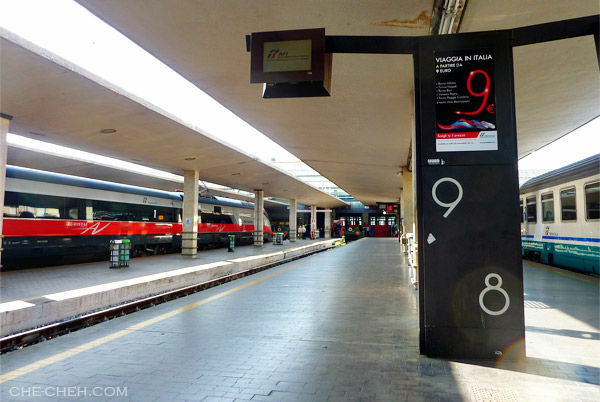 At Firenze Santa Maria Novella Railway Station @ Florence, Italy. Firenze means Florence in Italian. We arrived in Florence at 8.10am. Had brunch (croissant and buns) at the shop and waited for our next train which will arrive at 9.25am. We wanted to include Florence in our itinerary initially but we figured we won’t be enjoying our trip if we are to pack all together as the original itinerary is already VERY packed. So this is just a stop over. Next time then for Florence. On board 9406 Frecciargento from Florence to Venice. The journey took 2 hours 8 minutes. Ticket cost €43 per person. 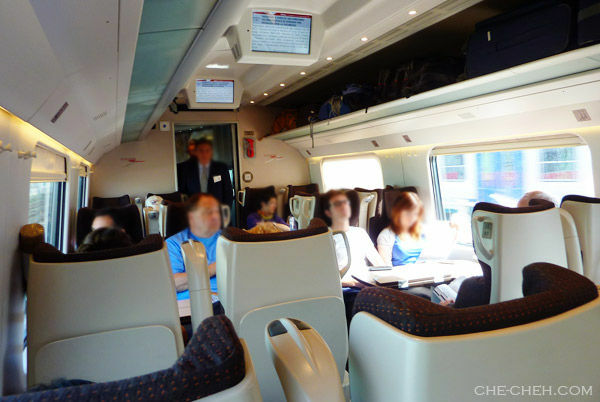 This is the most ‘modern’ train we rode in Italy. I love all my train rides in Italy. It was pleasurable and fun. We stopped by a shop beside the station to buy a Venice map @ €2.50. Then we head to the waterbus stop to get our transport tickets. The queue for the tickets was very long. 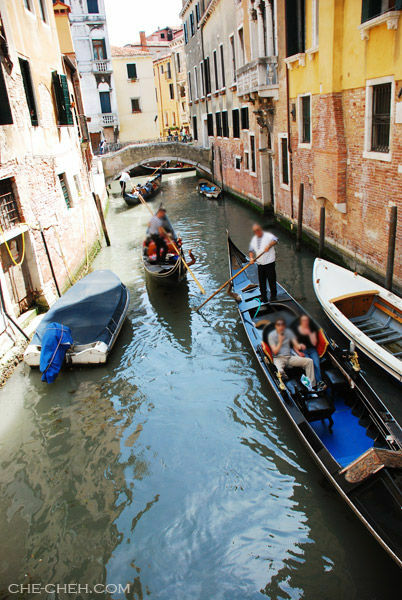 The waterbus ticket cost €7 per person for a single journey. It’s damn expensive!!! 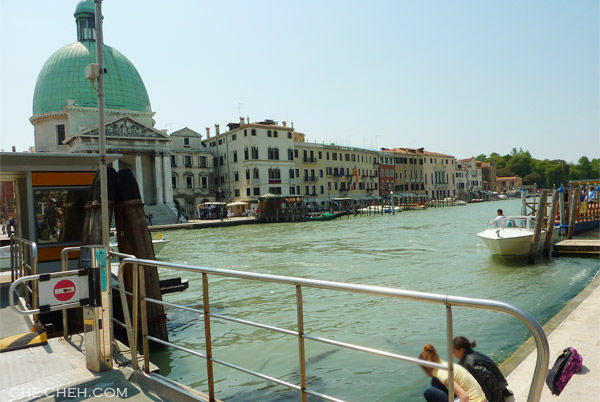 We ride the waterbus from Ferrovia (railway station) to Rialto Bridge. From there we walked to our accommodation for the night at Foresteria Valdese. I’ll write more about this place in my next post. It was a tough walk as we got lost quite a bit and also because of our heavy luggage. Luckily there’s an Asian woman (I think she lives there) that helped us. Finally we found it! At last we get to rest in our room at 1.50pm, over 2 hours after reaching Venice. Hahaha That’s how lost we were! 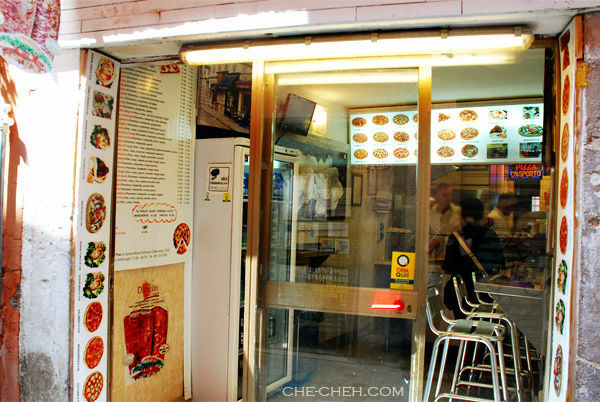 Less than half an hour later we head down to find food for our lunch which is the yummy pizza from Pizzeria Peter Pan. Sorry no picture of the pizza. 1 large pizza slice cost only €1. We bought 2 slices. Cheap ya. Then it’s a matter of tracing our route back to Rialto Bridge. From Rialto Bridge we walked to St. Mark’s Square. 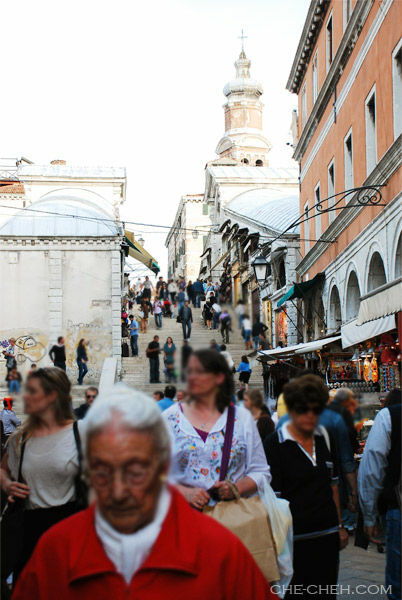 We did not enter St Mark’s Basilica as they require you to leave your bag before entering which is a bit difficult for us. Anyway the square is choke full of people that day. Maybe half of the reason is due to America’s Cup. Many tourist yeah at the bridge? 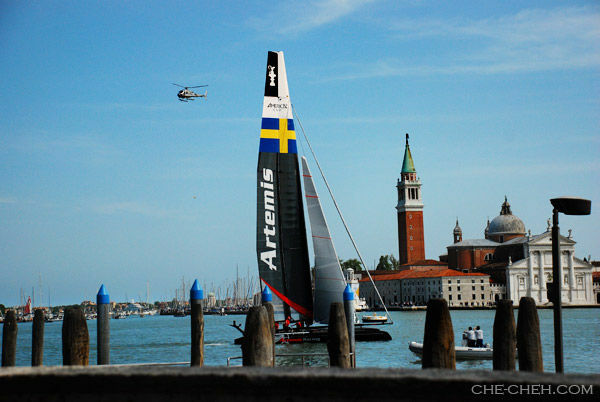 They’re there for America’s Cup and to view the Bridge of Sighs. One of the yatch competing in America’s Cup. 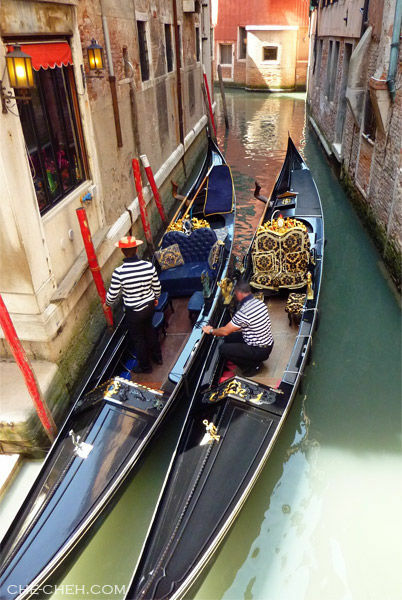 Just then a gondola passed by. What a view! 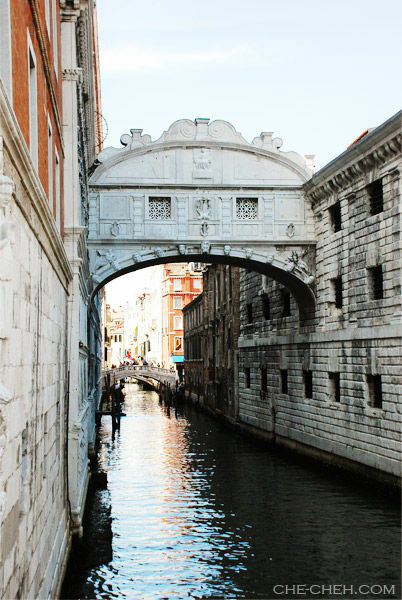 I love the Bridge of Sighs. 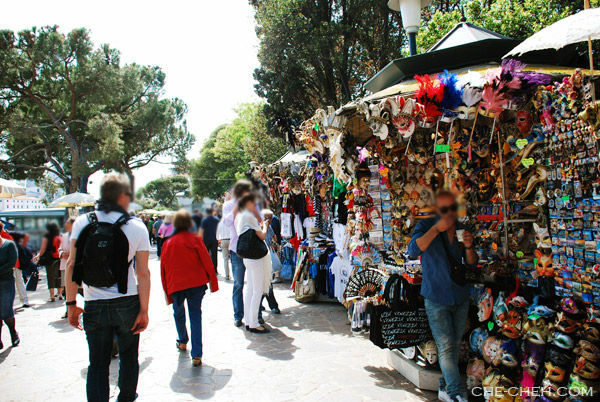 Souvenir stalls. Buy! Buy! Buy! Many souvenir stalls and shops carry the same goods so after awhile it’s quite boring looking at ’em. 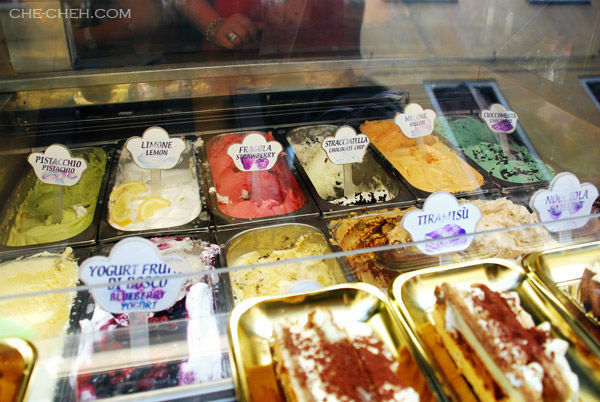 We stopped by for gelato @ €1.50 per cone. Not bad but not the nicest we’ve had. Like I said the best one is from Palazzo del Freddo Giovanni Fassi @ Rome. 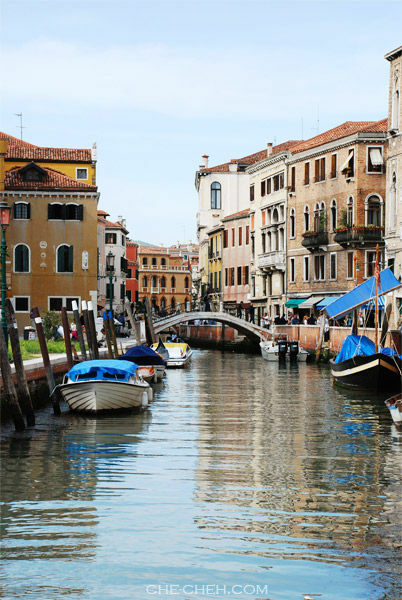 The Grand Canal near Accademia. 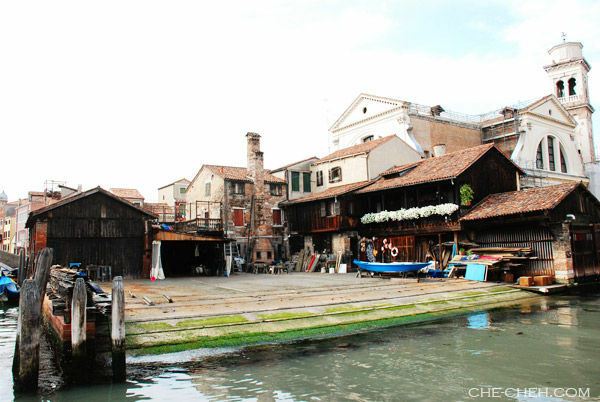 Gondola workshop (near Accademia Bridge). We also stopped by at Tonolo a famous bakery shop in Venice for their pastry. Picture perfect. It’s like from a painting! Our pasta dinner total to €22.00 at La Rivetta (including water cost €3.50!!! + service €2.50) at Sao Polo area. 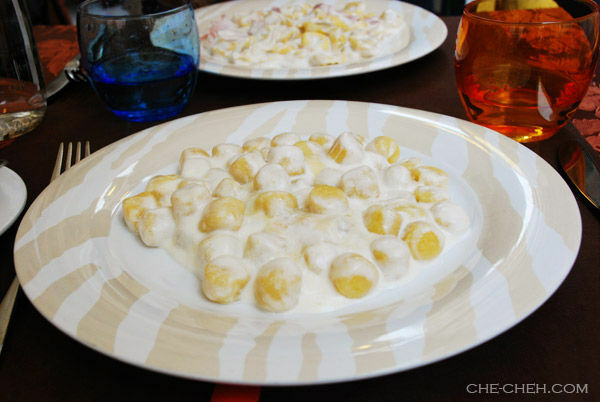 The pasta wasn’t that bad but both dishes looked quite the same and almost taste the same. The waiter should have told us. We couldn’t finished the dish and asked for take-away but they told us no take-away. BLOODY!!! Hence half of the food had to be thrown away. What a waste! We should have order one main and a side. Our mistake I guess. 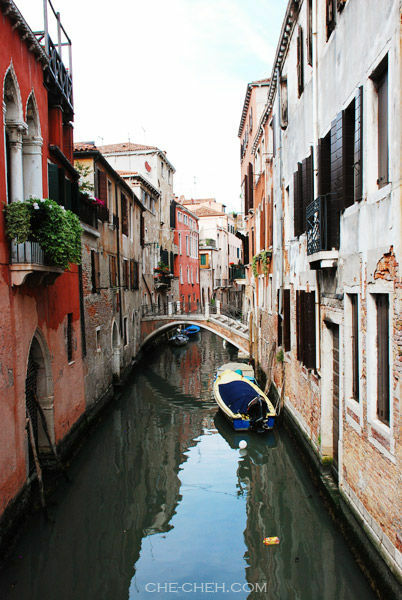 During this half day period, we’ve walked to S. Marco, Dorsoduro and S.Polo area. Now we’re heading back to Rialto Bridge via S.Polo. 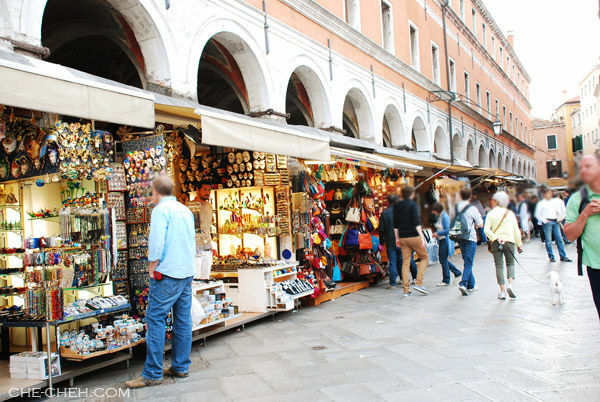 Souvenir stalls near Rialto Bridge. Up there is the famous Rialto Bridge. 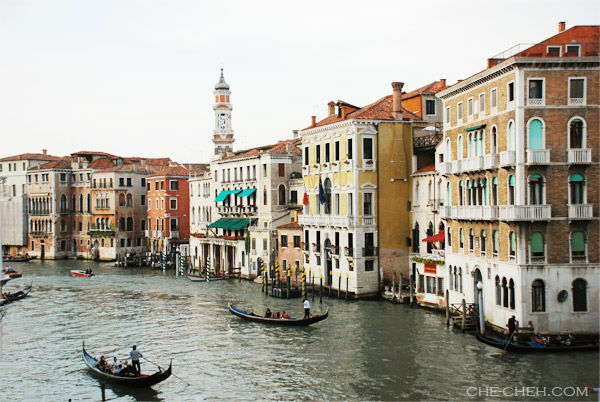 And this is the outrageously good-looking million dollar view from Rialto Bridge. 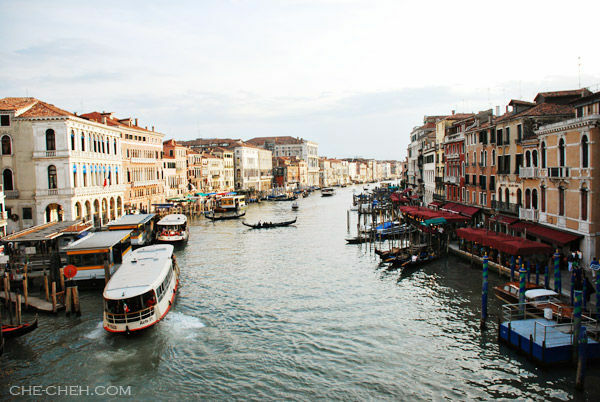 Another breathtaking view from Rialto Bridge. 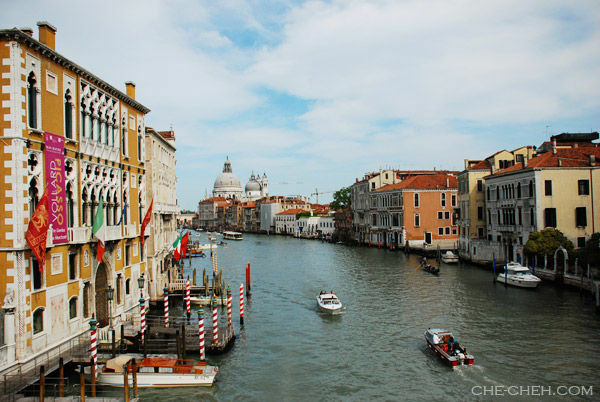 I love the picture syou took of Bridge of Sighs and from the Rialto Bridge. And I cannot believe there was not to go for the unfinished meals! Sure knows how to ketuk the customers. Ya ya the pictures nice ya. Wish the cloud is bluish. The waiter said they don’t have packaging for the unfinished meal wor. So fai. Do you buy some Venetian masks? Wanted to buy but at last decided not to. Coz difficult to carry in our luggage since we’re going to so many places some more. Besides my mom bought one already when she went there. So ok la if I didn’t buy. 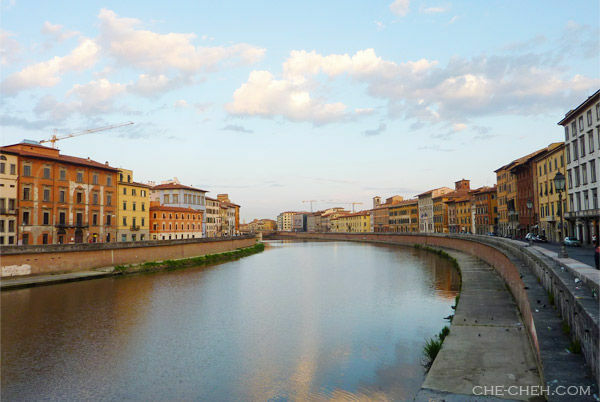 Beautiful view of the Arno River. Reminds me of Sungai Melaka hahaha!! but with much better view! 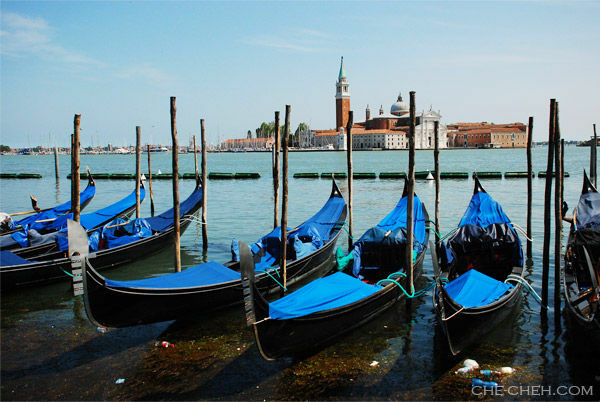 Nice view of the gondolas! Bridge of Sighs? What a name! Did you sigh when you were there? LOL! Nice name ya. Of coz no. Instead I jump with joy. Oh so it’s hard to find toilets in Venice? And they charge you for the toilets? What? No take-away?! What a waste!!! If me, sure heart pain when converting the money paid into Malaysian ringgit and have to throw away half the food!